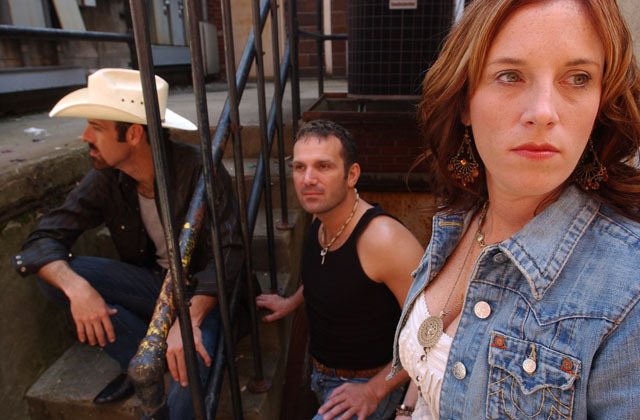 Brian Duckworth, Wendy Williams, and Greg Duckworth, are 3 siblings from Clarksburg, West Virginia, who's distinctive vocal harmonies set them apart and make them stand out when you hear them on the radio or see them perform live. Taylor Made has opened shows for Sugarland, Randy Travis, Charlie Daniels, Heidi Bloomfield, and perform regionally at fairs and festivals and clubs. Their last single, "Heavy Duty Beauty", went to #51 in Music Row and to #1 on the Indie World Country chart. Produced by Dale Morris and Dan Mitchell, their new single is called "Quiet Kind Of Crazy". When I got together with them here in Nashville at the Tracking Room for this interview, they were in town preparing for their upcoming radio station promotional tour. I asked them how long they'd been singing together and Greg said, "We grew up in a little Pentecostal church, actually there were 7 siblings. We grew up singing when the little blue haired ladies used to have to help us hold the microphone. We were that small, so we've been singing together our whole lives. We put together the trio for the Colgate Country Showdown back in West Virginia. We won the local competition and then it just built from there. People wanted to hear us and one of Dale Morris's associates was in West Virginia and heard us do a benefit concert. He brought us down, our second trip to Nashville was to record at Fireside Studios. Then we met Dale after that, worked with Dan Mitchell, and here we are." Wendy added, "We literally played on our back porch. Mom being single, she raised us. All of us either sang and/or played an instrument growing up, and that included singing harmony. She would go out on the porch and take a guitar out there and next thing you know, as long as we were old enough to walk out there, there we went. We'd sit and sing and even the neighbors would yell from the porches and just come down and join in or just listen. So we've been doing it since as long as we can remember." Brian said, "Wendy and I have been playing in bands since she was 12 and I was 16." I asked Wendy why she chose the song "Quiet Kind Of Crazy" to release as a single from their new album entitled "One Voice". "That song when we first heard it, it really struck a nerve and meant a lot to us. We were raised by a single mom and it's obviously a song about a single mom, and there was a time when I was a single mom (Wendy is the mother of 3 girls) and it's a really hard place to be at times. The support that you get you never know where it's gonna come from. It can come from someone who's been through that or it can come from your big brothers who are just there to help you. That song can mean so much to those that have supported or those that needed supported, so that's why I wanted to sing that song. It was written by our lead player, Dan Baily." When I asked them as a group if they had any advise to share with others trying to make it in Nashville, Wendy spoke first, "I will say this. It's not as easy as what you may think it is. When you first start out you get the stars in your eyes, but I believe it is 100% possible to pursue it if that's what you want to do. It's not going to happen over night, and it's not going to happen if you give up. So keep chasing it if that's what you really want to do but be prepared for the long road ahead." Brian said, "If it's worth coming here to chase, it's worth staying here to chase." Then Greg added, "I would just simply say stay true to what you're good at and what you know and for us that is the performing and the singing as siblings, performing our music. Don't worry about the wheels you can't control because it will drive you crazy. Stay true to what you know how to do and other things will fall in around that." You can visit Taylor Made at their web site at www.taylormadecountry.com where you can follow the band, buy their music, and keep track of their tour dates and events.